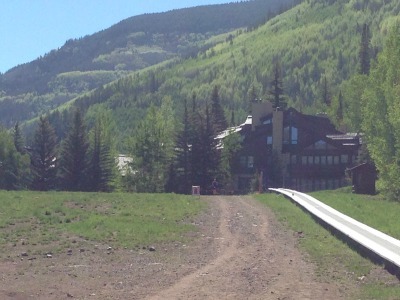 I'm no stranger to running around Vail, Colo. Thanks to an unseasonably warm winter in 2012, I ran almost as much as I skied that April, exploring the path along Gore Creek and checking out some hiking trails on the north side of I-70. But there's way more to running Vail that just the route I took from West Vail into Vail Village. That's child's play compared to the trails that are covered with snow most times I'm at the mountain--the ones that are open for hiking, biking and trail running in the summer months. Try running those and you're dodging tree roots, creating dust clouds, killing your quads on the downhills and catching your breath on the uphills. 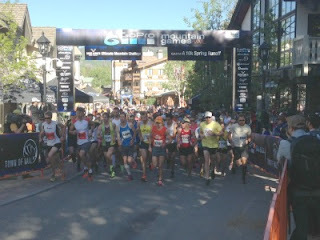 Had I known that before running the 10K Spring Runoff at the GoPro Mountain Games in Vail last weekend, I may have reconsidered registering. 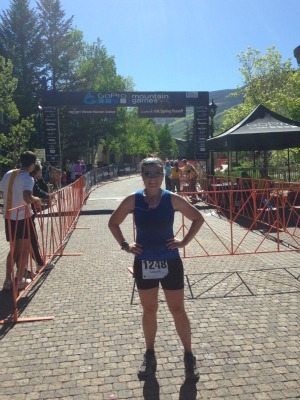 I would have been better suited for the Vail Pass Half Marathon, which was basically 13.5 miles entirely uphill, even though I could barely run 10 miles two weekends ago. But the scenery in the mountains makes any trail run worth it, even if you're sucking wind like me (those Colorado trail runners can RUN!). These pictures are only part of the race's excitement--I'll have to capture the rest when I'm hiking because I made the wise choice to run light. The 10K Spring Runoff started in the heart of Vail Village (and wouldn't you know, the exact spot where I had stopped documenting my last Vail run) and headed east toward the Golden Peak base. If you look really close, you can see me in the blue tank top, sporting my media team gear since I couldn't run with them Saturday night at the Balmoral 5K. 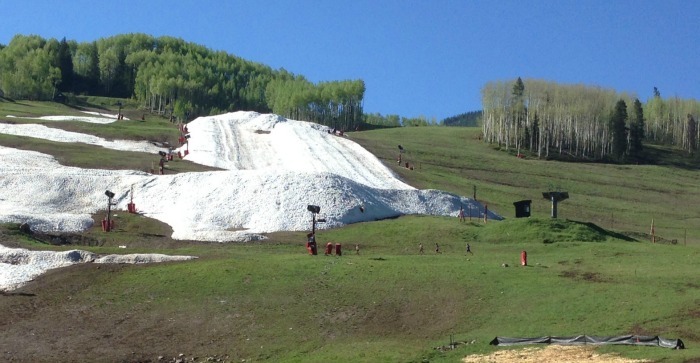 This is the Golden Peak ski area and those huge mounds of snow were even larger during the ski season when they were making snow and filling the terrain park. If you squint (or click on the image to make it a little bigger) you can see three runners beneath the right snow lump. On the left is the tunnel under the skiable terrain that we ran through near the start of the run to reach an uphill climb and then we ran through it again near the race's end. And that uphill climb? 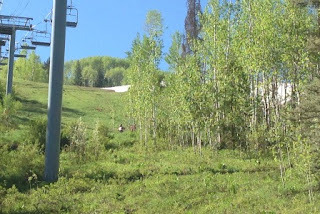 You can see it by the clump of trees on the right--and it doesn't look, or ski, nearly as steep as it felt climbing up. That tunnel I was referring to? It's just behind those trees. And again, if you squint you can see some of the trail speedsters (not me) about to run under the Riva Bahn chair lift. Some of the pretty mountainside and real estate that I don't remember seeing in the race's final mile (I'll blame it on being too focused running toward the finish line). You can barely see me, but I'm slowly but surely running down the dirt path. More of that pretty mountainside I was talking about, and some of those speedier runners making the final stretch of dirt look easy. Phew, I finished! Heat, winding trail, dizzying downhills and all. The trail's aftermath: dirty legs. 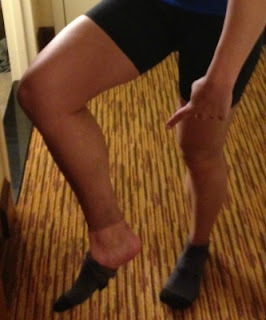 Check out that awesome sock line! 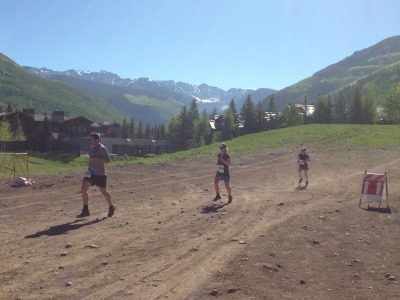 Have you run the trails on Vail mountain? Which ones are your favorite? 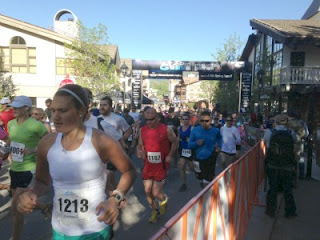 Did you run the 10K Spring Runoff? You probably finished faster than me!